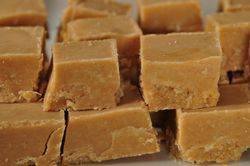 Peanut Butter Fudge is a simple enough recipe; just a mixing together of butter, peanut butter, vanilla, and confectioners' (powdered or icing) sugar. It belongs in the "no-cook" fudge category which Andrew F. Smith in his book "The Oxford Companion to American Food & Drink" tells us was developed in the 1950s. I love how this type of fudge is so much faster and simpler to make than the old fashioned fudge which involves using a candy thermometer. You might want to include this candy in your Christmas baking as it makes a large batch and can be made ahead and stored in the refrigerator for about a week. But don't think that just because "no-cook" fudge is easy to prepare that flavor is sacrificed. Peanut Butter Fudge has a rich peanut taste with a creamy smooth texture that literally melts in your mouth. To prepare the fudge you first need to melt the peanut butter with the butter. You can do this step on the stove (in a heatproof bowl placed over a saucepan of simmering water) or in the microwave oven. Once melted, stir in the vanilla and sifted powdered (confectioners or icing) sugar. That is it. Once made it can stored in an airtight container in the refrigerator for up to a week. So what is peanut butter? Peanut butter is a smooth paste made from roasted peanuts. The peanuts are ground, and then salt, a sweetener, and sometimes a stabilizer (to keep the oil from separating) are added. Peanut butter that is labeled "Old-Fashioned" or "Natural" does not contain a stabilizer which means the peanut butter will separate and you will have to stir the peanut butter before using. Now, when buying peanut butter, if you are concerned about trans fat, always check the list of ingredients to see if it is listed (labeled as "partially hydrogenated oil" or "hydrogenated oil"). Peanut Butter Fudge: Line the bottom and sides of an 8 or 9 inch (20 or 23 cm) square pan with aluminum foil or wax paper. Butter, or spray with a non stick cooking spray, the foil or wax paper. Place the peanut butter, butter, and salt in a large microwaveable bowl and cook in the microwave for one to two minutes on high. Stir and continue to microwave (if needed) until the ingredients are completely melted. (You can also melt the ingredients in a heatproof bowl placed over a saucepan of simmering water.) Then, using a spatula or wooden spoon, stir in the vanilla extract and powdered sugar. Spread the fudge into the prepared pan, smoothing the top with an offset spatula or the back of a spoon. Cover and place in the refrigerator until firm (at least two hours). To serve, cut into 1 inch (2.5 cm) pieces. Can be stored in the refrigerator for up to one week. Makes about 64 - 81 one inch (2.5 cm) pieces of fudge. Preparation time 20 minutes.